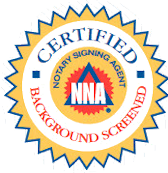 Mobile Notary Public services - A Florida Commissioned Notary that comes to you! For your convenience, I come to your location to notarize your documents . 7 Days a week! Serving the Mobile Notary Public needs of Bartow, Lakeland, Winter Haven, Mulberry, Highland City , Eagle Lake & Polk County, Florida. As a Florida Commissioned Notary Public, I can come to you to notarize your documents. You can also come to my office in Bartow during office hours if desired. I charge $15 for the first notarized document and $5 for each additional document (if needed). All of my posted fees include travel time and fuel so there are no hidden charges. I do limit myself to the Bartow, Mulberry, Highland City, Winter Haven, Eagle Lake, south Lakeland and surrounding area in Polk County, FL. My service is great for anyone that may be immobile, hospitalized, confined to a nursing home, caring for small children or just too busy to get out. I will come to you to notarize your documents. I also provide VIN verifications that may be required by the Florida Department of Motor Vehicles (DMV).